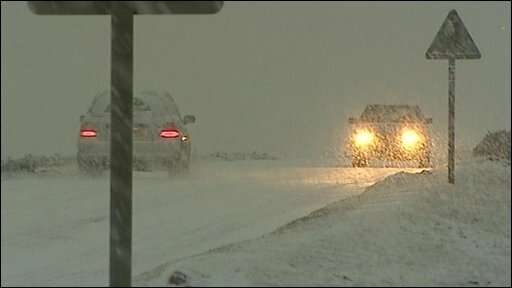 Heavy snow and icy roads are causing chaos across most of the UK, where Met Office severe weather warnings are in place as the "deep freeze" continues. Hundreds of schools closed, many roads are hazardous, and buses, trains and planes have been delayed. Several airports have suspended flights. Snow fell in Scotland, and large parts of England and Wales, in what is said to be the coldest snap in decades. Snowfalls of up to 30cm (12in) have been forecast for southern England. Forecasters say the band will stretch from London to Cardiff, and warn some areas may even see 40cm (16in) of snow on higher ground on Tuesday evening. As the weather deteriorates in the south of England, South West Trains have said they will be operating a revised timetable on Wednesday. The company hopes to run about 70% of its services. Southeastern Trains will also be on a revised timetable. It said only a "limited number of services" would arrive in London before 0900 GMT. Southampton Airport closed on Tuesday evening, and there is widespread congestion on many of Hampshire's roads due to heavy snow. The A27 was blocked in both directions between the M27 junction and Segensworth because of abandoned cars. All flights in and out of Gatwick and London Luton airports have been suspended. On Monday the National Grid issued a gas balancing alert (GBA) for only the second time, asking power suppliers to use less gas as more was sourced overseas. Extra gas - including supplies from Belgium and Norway - was necessary to meet rising demand after a 30% rise on normal seasonal use during the cold snap. Prime Minister Gordon Brown denied the UK was facing a gas supply crisis, adding: "There are always difficulties when we have a long spell of bad weather." Commuters faced major delays on Tuesday, with accidents and jams on several motorways, including the M60 in Greater Manchester where a lorry driver died in a crash. There were also delays on the M58 and M6 in Lancashire, the M1 in West Yorkshire and the M20 in Kent, while heavy snow forced the closure of part of the A66 in Cumbria. On Tuesday evening, the M6 was closed in both directions between Newton-le-Willows and the Croft interchange near Warrington. Earlier, a pregnant woman gave birth on the M53 after getting stuck in traffic. Within minutes of the ambulance arriving, the baby was delivered. In North Yorkshire, a driver escaped uninjured after his car was hit by a train when it skidded on snow and onto rail tracks at a level crossing near Selby. The 44-year-old man managed to get out of his car before it was hit by a Hull-to-Manchester train. A six-year-old boy is in a critical condition in hospital after he fell into an ice-covered garden pond in Crookham Common near Thatcham in Berkshire. It is thought the boy had been underwater for 30 minutes. Train operators including Virgin Trains and East Coast - which link London and Scotland - Arriva Trains Wales, Cross Country, First TransPennine Express, Northern and Scotrail were all reporting disruption. Manchester and Leeds Bradford airports were closed temporarily, and passengers at London Heathrow, Gatwick, Edinburgh, Glasgow, Aberdeen, Durham Tees Valley and Newcastle airports all faced disruptions. Production at one of the largest factories in the UK, Airbus at Broughton in North Wales, was halted by the wintry weather when staff were sent home following the advice of North Wales Police. Airbus, which employs 6,500 at the site, says it hopes to be working as normal on Wednesday. Snow fell overnight in Scotland - where temperatures were -15C (5F) in places - in north Wales and northern England. Large parts of the Highlands and north-east Scotland have been cut off, with the main route - the A9 - shut in several places. Around Aviemore and Kingussie there is more than a metre (4ft) of snow. Most of Scotland's trunk routes are open but many minor roads and pavements are treacherous. Rob Varley, the government services director for the Met Office, said the UK was seeing the worst cold snap for at least 20 years. "It's a long time since we've been stuck in this kind of rut for this long through a winter," he said. School closures were commonplace across Scotland due to the continued sub-zero conditions, councils said. And schools in Aberdeenshire, East Lothian and the Borders, and Dumfries and Galloway will remain closed on Wednesday. 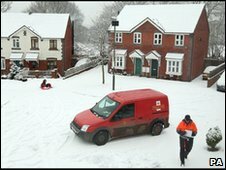 Hundreds of schools in northern England and the south-west were also closed on Tuesday after heavy snowfall. More than 250 schools closed in West Yorkshire, and 102 in Cornwall. Sporting fixtures have been affected, with the first leg of both Carling Cup semi-finals postponed because of extreme weather. Blackburn were due to host Aston Villa on Tuesday, and Manchester City were to play Manchester United on Wednesday. Tuesday's National Hunt meetings at Leicester and Taunton have been abandoned, along with Southwell and Hexham on Wednesday and Ludlow on Thursday. Huntingdon's meeting on Thursday has also been abandoned due to a frozen track. Meanwhile, motorists in many areas were being warned to make only essential journeys and to prepare themselves with warm clothes and blankets in case of breakdown. Driving conditions worsened with rain, sleet and snow falling on already icy roads and pavements. By 1300 GMT the AA had attended about 9,000 breakdowns since midnight and predicted its total for the day would be around 16,000. This compares with around 9,000 for a normal Tuesday. The motoring organisation's busiest areas were Manchester, Liverpool, Warrington, Leeds and Stoke. The freezing weather has triggered cold weather payments in several areas, including Greater Manchester, Guildford in Surrey, Sheffield and Dundee. The government gives £25 to people on benefits when the average temperature has been recorded as, or is forecast to be, 0C or below over seven consecutive days. The payment threshold was triggered in London on Monday, meaning more than half a million people will receive payments totalling more than £13m. The current big chill is a result of high pressure over the polar region, which has pushed cold air out of the Arctic towards much of northern Europe, parts of Asia and the US. 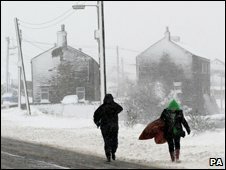 Winds from the north and north east, rather than the south and south west, have brought freezing temperatures to the UK. Provisional Met Office figures for December show temperatures for much of the UK were 1.5C and 2.5C below the mean temperatures for the last 30 years. Scotland saw temperatures dip still lower - from 2.5C to 3.5C. On Thursday, temperatures in Scotland plunged to -22.3C in places. Winds from the north also brought cold weather to parts of Asia, with Beijing receiving its heaviest snowfall for nearly 60 years. At the weekend, up to 30cm (12in) of snow fell in China's capital and its neighbouring port city of Tianjin. Dozens of people have also died in a cold snap in northern India. However, while parts of the world suffer freezing temperatures, the seesaw patterns mean other areas are warmer than usual, including Alaska, northern Canada and the Mediterranean. Met Office figures for the end of 2009 show some places dropped 10C below the average, while others were 10C above.